The holidays are always more special when you make your own gifts and cards. 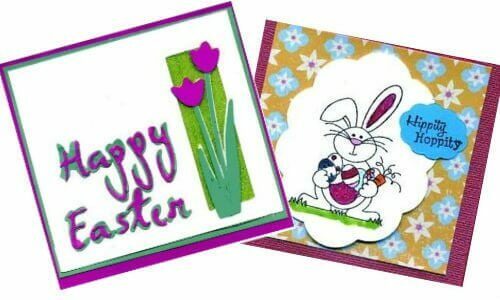 This year try making your own Easter greeting cards. This is an activity that the kids can participate in. Easter cards are extra fun to make because of the vibrant colors and bunnies that are required to make them! There is not wrong way to make your own card, but here are some suggestions on how to make your own! Cut out and fold your construction paper into whatever shape you want and into whatever direction you want it to open up into. Use your purple stamp ink pad to dip your Easter stamps in, and print them on to the cover of card. Using your stencils, trace some Easter shapes on to the neon craft foam sheets and cut them out with your scissors. Place you foam pieces on to your card wherever you desire. Use your markers in different vibrant colors to highlight the stamps you made with your purple ink. Write a special Easter message inside the card using your markers. You can alternate colors to make extra pretty and craft! Happy Easter crafting.